The Horizon RC-30 recumbent exercise bike has a strong commercial-based frame, quiet and smooth operation, and a low price that will win you over. The clear LCD screen shows workout feedback. 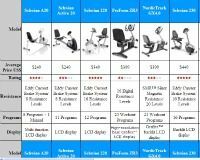 The 8 resistance levels and 8 preset programs include Manual, Intervals, Rolling, Weight Loss, Tempo, Random, and 2 Custom workouts. UPDATE: The RC-30 recumbent bike has been replaced by the all new Comfort R Bike. Check it out on sale at the official Horizon store! 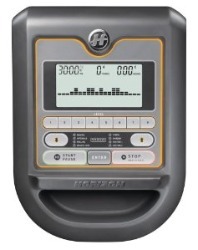 The Horizon Fitness RC-30 features the patented FreeSPIN™ technology that allows the flywheel to spin independently of the pedals so you can safely slow the pedal rotation rather than experience an abrupt stop that could jar your joints. The recumbent exercise bike has a low height seat and the step-through frame allow the user to get on and off easily, and the adjustable ERGOfit™ seat base and lumbar support back pad offer better-than-average comfort. Comments from reviewers on this recumbent bike are some of the best we’ve ever read. 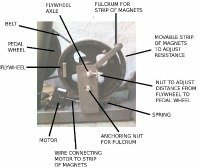 It scores well in terms of attractiveness, ease of use, smooth pedaling, quiet operation, variety of programs, adjustable seat, quick set-up, and decent warranty. Users of the Horizon RC-30 note that the bike is larger than previous recumbents they had owned, but for the price and quality, that is a small issue. In fact, a couple of users close to 300 pounds said they felt comfortable on this exercise bike and that it helps with knee problems when no other type of equipment would work. Nearly all reviewers said they would highly recommend it to others. While this certainly isn’t a club quality bike, you get very good value for your money. For casual cardio pedaling, or for more serious weight loss training, the Horizon RC-30 recumbent exercise bike will serve your needs. 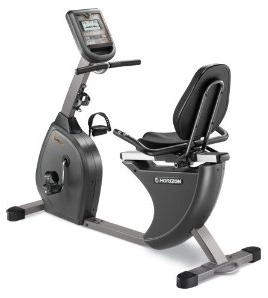 It is a Best Buy for just $399, and is the top performing recumbent at this price level.